This volume is the result of the authors’ research efforts to illustrate the role of the corpus callosum in neural functioning during childhood. The book begins with a historical review of the callosal debate, anatomy, embryology, ontogenetic functions, and functions of the corpus callosum in adults. The main part of this volume comprises studies, using neuropsychological and electrophysiological methods, of the development of interhemispheric functioning at school age. Hypotheses are presented on the role of the corpus callosum in speech, reading and bimanual motor co-ordination, and the role of interhemispheric dysfunction in developmental disorders such as developmental dysphasia, dyslexia and dyspraxia. 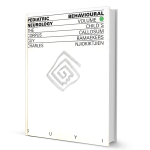 A substantial part of the book is devoted to clinico-pathological correlations, and to callosal morphological anomalies based on MRI data. Finally the authors show the usefulness of morphometry of the callosal sagittal area in children with learning disabilities. The book tries to forward the notion that interhemispheric dysfunction often occurs in children with developmental disabilities. This volume is useful for professionals, child neurologists and psychiatrists, psychologists, and neuroradiologists, who want to find a wealth of information and references on the normaland abnormal development of the corpus callosum, and abnormal interhemispheric function. Order this book online at Suyi Bookshop.